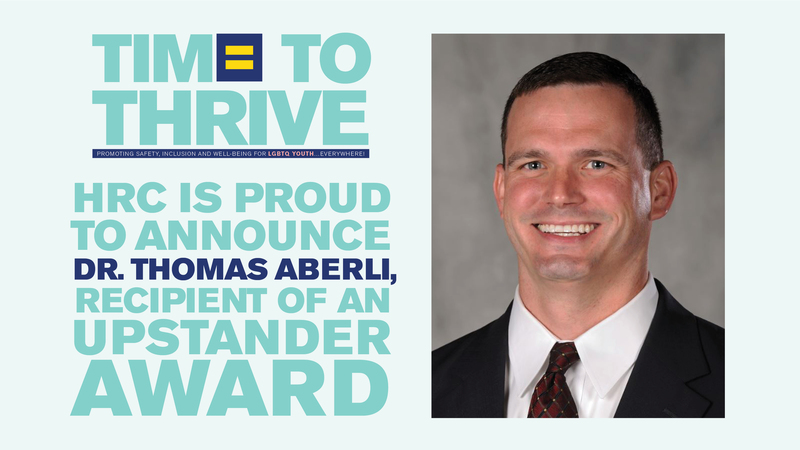 Today, the HRC Foundation announced that award-winning Kentucky principal Dr. Tom Aberli will be honored with the Upstander Award at HRC’s annual Time to THRIVE Conference. Three years ago, Dr. Aberli oversaw changes at Atherton High School that led the school to become the first in the state with a transgender-inclusive policy for students. Since then, he has been a strong and persistent advocate for these fair-minded policies. HRC’s Time to THRIVE, the nation’s premier conference for K-12 educators, professional counselors and other youth-serving professionals on LGBTQ youth safety, inclusion and well-being, will be held April 28-30 in Washington, D.C., in partnership with the National Education Association and the American Counseling Association. The policy change at Atherton High School in 2014 was not without controversy. In an interview with PBS NewsHour, Dr. Aberli explained how the policy reflects the school’s own values. “Our school protects all students and the issue of gender identity has simply been a demonstration of the school’s commitment to respecting all individuals in our school,” said Dr. Aberli. Dr. Aberli also made clear that he was not initially an expert and had his own journey to take. Maddie Dalton, the transgender student whose courageous coming out spurred the school to take action, agreed. “It all comes down to being respected as a person and accepted,” she said. Dalton provided guidance -- including a list of ways the school could ensure transgender students were treated respectfully -- throughout the process. Atherton High School is now a national model for transgender inclusiveness and Dr. Aberli has spoken frequently about the school, including interviews with MSNBC, NPR, the Washington Post and numerous other television, newspaper and radio outlets. He has spoken before the Kentucky Senate Education Committee and has presented on this topic at educational law conferences in Kentucky and Indiana. Dr. Aberli has been a school administrator since 2001 and received his doctorate in Educational Leadership from the University of Kentucky. He was elected to the Board of Directors of the Kentucky Association of School Administrators and was recently named Kentucky's Administrator of the Year. He has served on the Principal’s Advisory Committee to the Kentucky Commissioner of Education and was selected by the Governor to be a member of both the state Youth Bullying Prevention Task Force as well as the state’s School Curriculum, Assessment and Accountability Council. The Time to THRIVE Conference features 72 workshops by more than 45 national and grassroots organizations dedicated to improving the lives of LGBTQ youth. Special conference guests and additional speakers. Time to THRIVE is the premier national convening of educators and youth-serving professionals to build awareness and cultural competency, learn current and emerging best practices, and gather resources from leading experts and national organizations in the field. Time to THRIVE will take place April 28-30 in Washington, D.C. with Toyota as the presenting sponsor. To register, visit www.TimeToThrive.org.